Do you want to learn German or refresh, improve and deepen your existing knowledge? Our free online resource is made for those looking to start out at the very beginning and for advanced learners that want to reach fluency and perfection. Whether you are a student learning German, a professional seeking work in Germany, Austria or Switzerland, or a person working for a company that has close relationships with these areas, our program is perfect for you. It's also a great way to learn the basic words and phrases needed during a trip, or to gain insight and practice if you simply love German culture and want to speak the language. We offer innovative tools for learning German. Practice vocabulary, use the most important verb conjugations in all the different tenses, and drill all major grammar topics with our entertaining online exercises. The German language is the first language of over 100 million people who primarily live in Germany, Austria and Switzerland. These countries are highly developed and economically strong, thus making them attractive locations for work and living. Many workers come from distressed nations looking to join these active workforces, and since Germanic nations are the international headquarters for many scientific and technological powerhouses, they attract many highly-educated foreign workers. 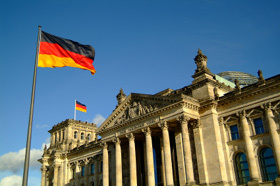 Even if you aren't planning on packing up and moving to Germany, many international companies work closely with German speakers, and many Germanic companies are international commerce and production leaders. The Germans used to say, "German language, difficult language," and there is some truth to that. Mastering the grammar requires a lot of effort, time, patience and most importantly, practice. Some of the topics that create problems for English speakers are the four different cases, the three noun genders, the distinct verb forms according to person and tense, and sentence construction. On the other hand, German and English are more similar than most people think. As Germanic languages, they are closely related. Because of this, you will understand German words and texts quite quickly. If you want to test this theory, take a look at the vocabulary of a Slavic language. As a beginner, you may not recognize a single word. As you can see, learning German is a valuable way to connect with our world and improve yourself. Although there are challenges, our program will help you overcome them through entertaining and enjoyable practice sessions. Explore our language tools and get started today!